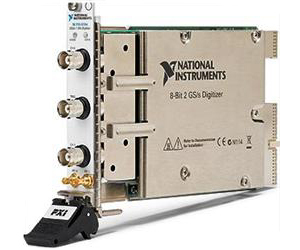 NI 5154 digitizers/PC-based oscilloscopes provide the industry’s first gigahertz solutions optimized for automated test. They feature a 1 GHz analog bandwidth and up to 2 GS/s real-time sample rate. A digitizer optimized for automated test leverages a high-throughput bus to lower test times, provides picosecond-level synchronization among modules, and integrates with the entire suite of NI hardware – including arbitrary waveform generators, high-speed digital I/O, and other digitizers – so you can build and customize a complete mixed-signal or high-channel-count test system.